Girl Scout Cookie season runs from January through March, which means now is the time to stockpile enough Samoas and Thin Mints to last you through, well, April, if we're being honest. This year is an extra-special one in the cookie calendar, because it marks the hundredth anniversary of enterprising young girls selling us baked goods with benefits (specifically educational and community benefits). That brings the total number of current cookies to 12, which begs the century-old question: Which Girl Scout Cookie is best? To settle the matter once and for all (until next season), we recruited a man who knows a little something about baking: pastry chef Dominique Ansel, owner of the eponymous New York bakery and inventor of the Cronut®, the world's first viral pastry. We asked Ansel to taste the full lineup, rating each cookie out of 10 points based on flavor, texture, balance, and downright tastiness. 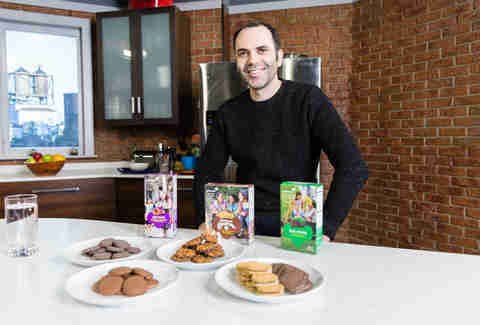 Read on to find out how the new cookies on the block fared against popular favorites like Do-si-dos, Trefoils, and Tagalongs. "This is not my favorite. The pieces of toffee are tiny and hard, and they kind of stick to your teeth. It tastes starchy because it's mostly rice flour and tapioca starch, that's what makes it gluten-free. It's possible to make a really good gluten-free cookie with almond flour, but it's expensive. I only do two cookies at the bakery: a chocolate chip and a flourless chocolate cookie. It's rich with almond flour and chocolate, so it's flourless but not starchy at all." "It still has that starchiness, although it's not as bad as the other gluten-free one. I like the peanut butter. When I was a kid my mom bought this spread from the supermarket and put it on a baguette for me, and I loved it. It was really exotic to me because French people don't eat peanut butter -- they don't know what it is. But for some reason the supermarket never had it again so I forgot about it. And then years later I moved to America and I remember eating it and having this flashback to when I was a 4-year-old kid. It took me by surprise because I had totally forgotten the flavor of peanut butter, but now it's really nostalgic for me." "It's not bad but the fudge layer on the bottom is very thin. I like that it's chocolaty on the bottom. If I could write a letter to the Girl Scouts I would ask them to make a chocolate chip cookie, it's one of my favorites. At the bakery I really enjoy them in the afternoon, always with black coffee." "This is not my favorite cookie in terms of texture, it's pretty one-dimensional. It's crumbly and that's it, there's just one layer. The shape is different; the box says it's a 'crispy, zesty lemon wedge.' I like the size, small cookies are perfect for a snack. You can leave them on the table and grab them as you wish. I kind of like the acidity of the lemon dust on top, it's sweet and sour at the same time. Maybe this would go well with a floral tea like Earl Grey." "I'm OK with this. It tastes a bit like artificial lemon and I'm not a huge fan of lemon in my cookies, I prefer something chocolaty or nutty. It's a simple cookie, the texture is nice. It's not bad but it's not my favorite. Compared to the other lemon one I'd say it's a little better, the other one was very powdery and this one has a better texture." "What is it supposed to look like? Are these waves? This is simple, it's tasty. Good shortbread is about the crumbly texture more than anything else, and the buttery taste. After you eat it you should still have that dark, brown-cookie flavor from the baking and a good afternote of butteriness. This isn't as buttery as the one I make, it's a little drier, but that probably makes it more shelf stable. These cookies have to be shipped, so we have to take that into consideration. I think this is a pretty good shortbread." "I like this a lot. I like the super-thin shell of chocolate on the outside. I'm not a huge fan of chocolate and mint together but here it goes well because the mint flavor is very delicate, it's not over-pronounced. The texture is super-crumbly and that's what's fun about it, you don't have to chew too much, it kind of melts in your mouth. I also really love the thickness and the size. It's not too big, just a few bites." "I think this is a fun thing to do with a cookie, and it pretty much tastes like a s'more. I just wish it had marshmallow, that would change everything. Just like a thin layer before they rolled it in the chocolate. I'm always excited by s'mores, I have my own version, it's a frozen s'more with vanilla ice cream coated with a chocolate wafer and pushed inside a honey marshmallow. We torch it to order so the outside is caramelized like a creme brulee. I took it to our Tokyo store and, believe it or not, it went viral. I always think it's amazing that I'm a French chef who learned about something that's very culturally American, and I took it to Japan where they had no idea what s'mores were and they loved it. It's still one of our best sellers." "This one is a sandwich with white and dark chocolate ganache inside. I think it's supposed to look like marshmallow but it's just chocolate. The ganache doesn't go all the way to the edge, so when you bite into it it falls apart a little bit. This one is a little creamier compared to the other one, and it has a bit more crunch. They both taste very similar but I think there's more structure and texture to this one, which makes it a little more interesting to me. I wish they had a marshmallow layer in here to add another dimension, but it might not be easy to add for technical reasons. I can see how it kind of tastes like s'mores but to me there's an important part that isn't here. But it's still a fun way to enjoy cookies, and it's actually pretty good." "I love coconut. Caramel, coconut, chocolate -- you can't go wrong. The flavor is really well-balanced, nothing is too pronounced. I love the texture of this one. It's chewy, coconutty, and it has the thin layer of chocolate on the bottom which is probably holding it all together but also adds a little bit of crunch. The texture is so different to all the other ones. What I love most about Girl Scout Cookies is that they're all really unique and they all have their own personality. This one is summery, it's exotic. And I love the shape, it's a fun one." "When I first bit into it I thought it was a little hard, but once you eat it with the peanut butter it actually goes well together. The peanut butter flavor is very nice; it's really nutty and deep and roasted. It's rich, it stays in your mouth for a long time. And like I said, I love peanut butter, it's nostalgic for me. That's what people call comfort food -- the food that you grew up eating that makes you feel good. I'm a professional pastry chef so I eat pastries differently to most people. I analyze it, I think about it. But in the end I'm like everyone else. The way the food makes me feel is what's important. That's what I remember." "This has very playful textures which is rare for a cookie, usually they're one-dimensional. 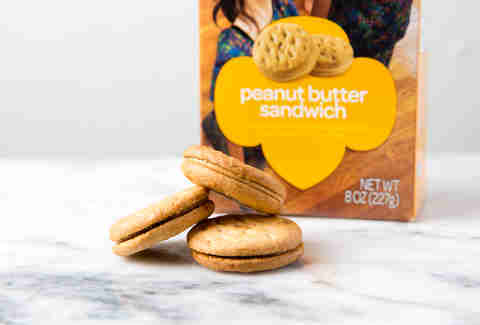 It has the crunchy cookie on the bottom with a thin, tender layer of peanut butter on top, and a chocolate shell on the outside that adds a different flavor. It's fun, there are a lot of different flavors and textures. That contrast is what I look for when I make pastries. The balance is pretty good, if it was me I would add a little bit more peanut butter just because I'm picky. It smells good, like peanut butter. It's crumbly, it's super-easy to eat. This is my favorite, I really like this a lot." 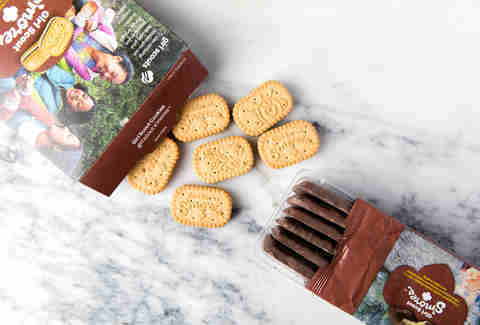 Sarah Theeboom is a freelance food, travel, and lifestyle writer from Australia who tried Girl Scout Cookies for the first time while working on this story. 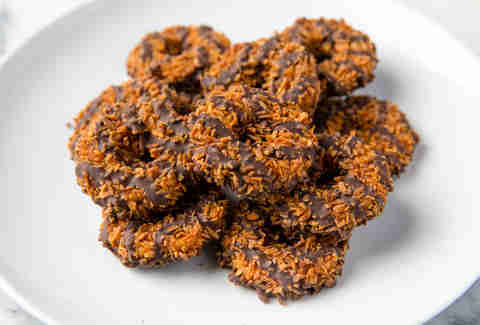 She liked Samoas the best. Follow her on Instagram or Twitter.